The U.S. Census Bureau recently released the latest population estimates for localities in the United States, and in keeping with trends from recent years, metro areas across the Sun Belt continue to flourish. Given that everything is bigger in Texas; it is most appropriate that the Lone Star State is adding new residents in significant numbers, thanks primarily to the state’s metropolitan growth. 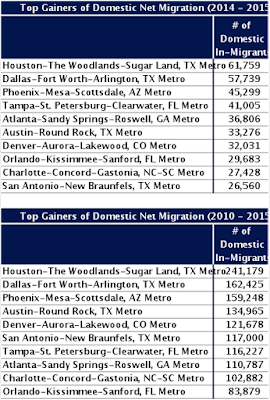 The Houston, Dallas-Fort Worth, Austin, and San Antonio metro areas collectively added 412,467 people between 2014 and 2015. These metros by themselves added more people than any state in the country over the past year except for Texas itself. 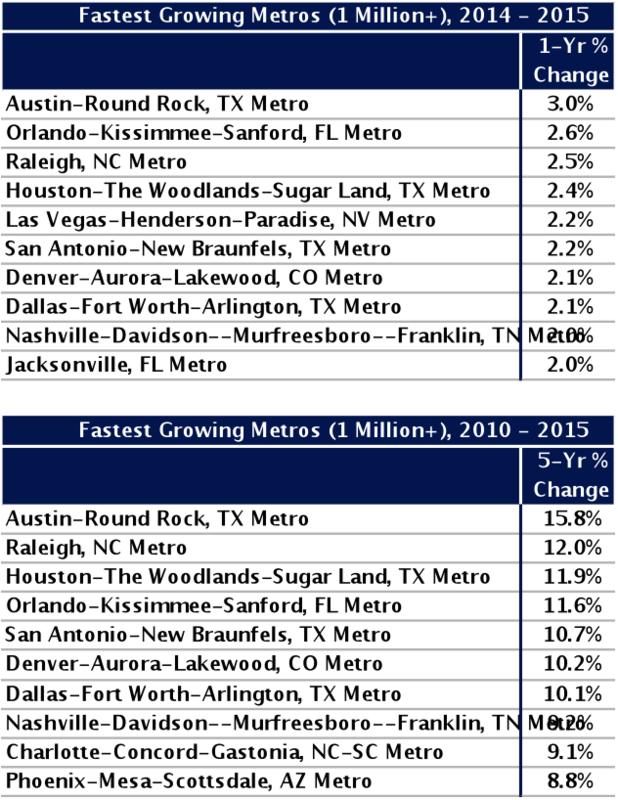 Below is a listing of the top-ten metros (out of 381) by one-year and five-year population growth rates. 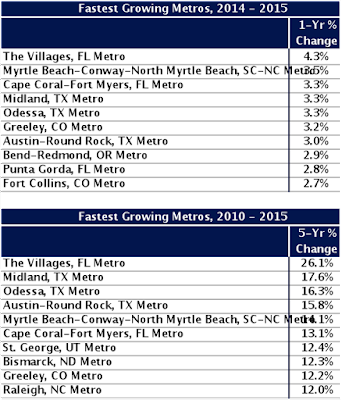 The Cape Coral-Fort Myers, FL metro unseated the Austin, TX metro as the fastest growing metro in the country. 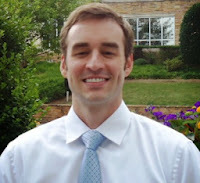 Austin previously occupied that position for each of the past four years. 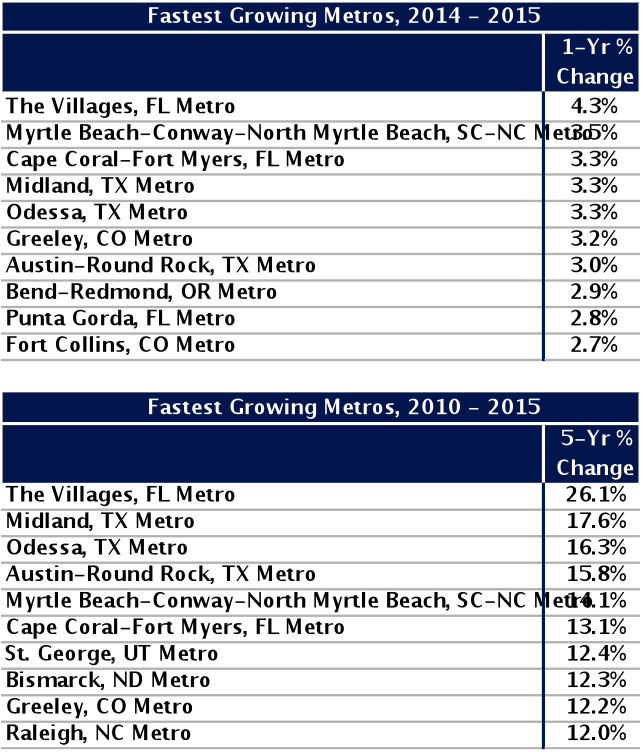 As indicated in the table, the fastest growing metro areas in the country are concentrated in Sun Belt states – namely Florida, Texas, and the Carolinas. 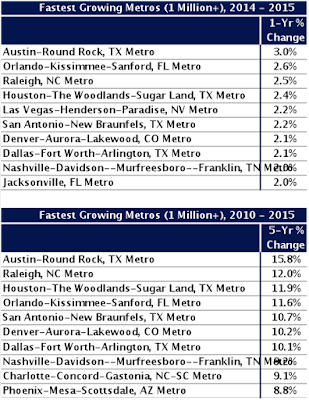 Of the 20 fastest growing metro areas over the past year, a whopping 15 of them were in Texas, Florida, South Carolina, or North Carolina. This dynamic is even more pronounced when one-year and five-year population growth rates are isolated to metro areas with at least 1 million residents. The population growth figures speak for themselves, but another additional layer of the population growth conversation is where these new residents are coming from. The U.S. Census Bureau tracks the components of population change in terms of natural growth (births minus deaths) and both international and domestic migration. Domestic migration is especially critical to track because it is indicative of how much more desirable certain places within the United States are over others. Domestic migration captures those people who have chosen to move from one city to another. People move between places for an assortment of reasons – job opportunity, retirement, military orders, etc. – but domestic migration is primarily an indicator of economic opportunity, since that is a central reason why and where people move. The following table again shows the dominance of the Sun Belt region as an increasingly attractive place to live and work. 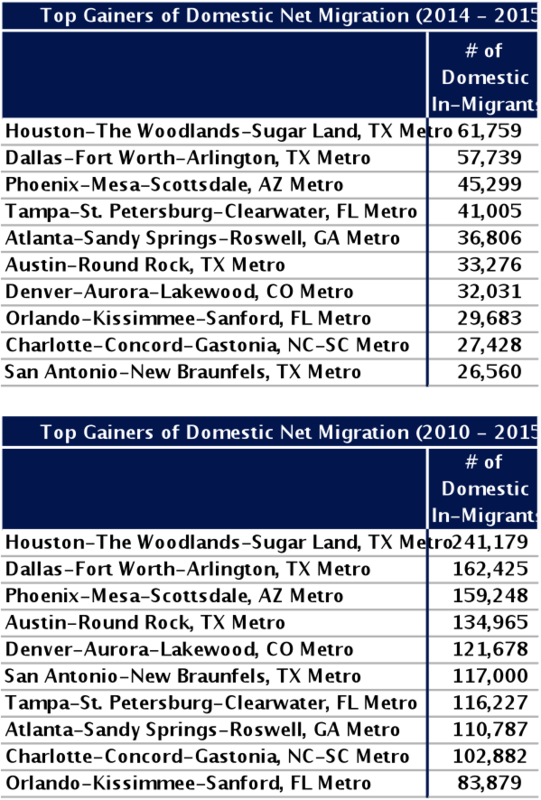 The top metros in the country over the past year and the past five years by measure of domestic migration is a who’s who list of some of the top-performing metro areas in the Sun Belt region. The Sun Belt’s rise can be primarily attributed to the growth of industries like aerospace, defense, auto manufacturing, and oil & gas all of which have thrived in the Sun Belt in recent years. Companies in these industries and others have taken advantage of the low involvement of labor unions in the region, as well as the robust portfolio of transportation assets – ports, railways, highways, and airports – that make many Sun Belt states attractive places for major manufacturing companies to invest. According to data from Economic Modeling Specialists Int’l (EMSI), 58.04 percent of the nation’s total job growth from 2005 to 2015 was captured by the following twelve Sun Belt states: North Carolina, South Carolina, Georgia, Florida, Alabama, Mississippi, Louisiana, Texas, New Mexico, Arizona, Nevada, and California. These states also accounted for 61.2 percent of the nation’s population growth over the same time period. The Sun Belt region’s rapid population growth has also led to the region’s increased political influence. Since 1970, Sun Belt states have gained over 25 electoral votes and many of the region’s states are evolving into ‘purple states’ as rapid diversification remakes the political landscape in the region. Much has been made about the declining populations of rural communities across the United States, many of which constitute a large portion of the Sun Belt region. However, as recent population estimates from the U.S. Census Bureau indicate, the region’s metropolitan areas are cementing themselves as booming population hubs that continue to attract new residents in droves. The downturn in the oil & gas industry and its impact on major Sun Belt metros like Houston is not captured in the recent population estimates. It will be interesting to see if there is any evidence in coming years of the oil & gas industry’s downturn thwarting some of the significant population gains being experienced in that part of the country.